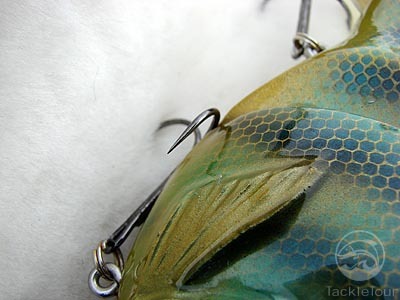 Introduction: Lure covers are certainly not a brand new concept, and there have been a number of which that have been introduced throughout the years, many of which found mixed responses from the market. EZ Bass (Professional Angler, Mark Lassagne) and Zander take a look at CoverLure premium lure covers to see what makes this product unique and different from traditional offerings. Impressions: Covers Lures has come out with a complete line of wraps designed to conceal and or protect your fishing lures. What makes the CoverLure offering different is the natural sheep wool lining. 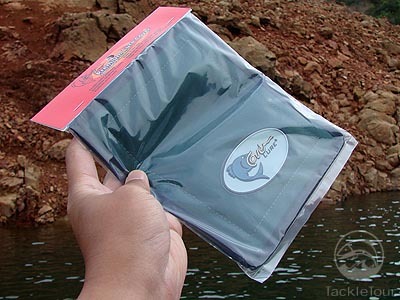 Fly fisherman have employed this material for years, and use it to hold flies. If you hook a lure into natural sheep�s wool it would be kept safely and still can be removed easily for use because of the interesting property of the natural sheep�s wool itself which has no closed fibers, therefore will not engulf a hook as does a man made fiber such as vinyl or nylon or even the natural fiber of cotton. 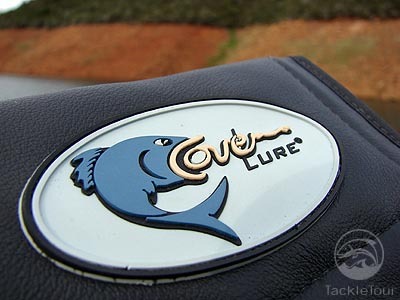 The CoverLure�s function either on or off your fishing rod and are currently available in 3 sizes and 6 different colors, they even have custom embroidery available, a great example of this are ones that Cover Lure has done for Black Dog Baits. Each side is complete with a thick strip of Velcro to hold whatever you put inside, in place. First impressions: The first thing Mark said when he first examined the Cover Lure products was �Wow! These are head and shoulder above what�s been out there previously.� The CoverLure looks and feels like a much higher quality lure cover than any other that we have seen to date. It doesn�t feel flimsy or thin, as many other covers do. When a large lure is inserted into cheap covers it almost feels like the lures are going to break right through the plastic, nylon, or vinyl. 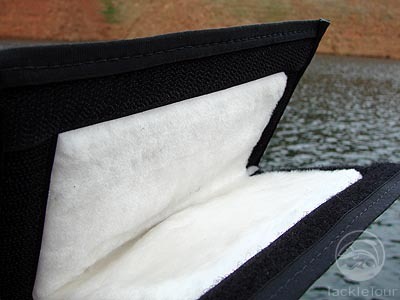 With the CoverLure�s thick wool padding it is hard to even distinguish where the hooks are. The Field Tests: Mark and Zander used the CoverLure to hold a variety of lures ranging from Megabass crankbaits to oversized swimbaits over a period of two months. 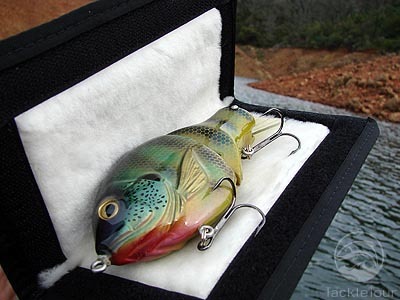 Performance: In using these lure covers we found them to be exceptionally reliable and durable. 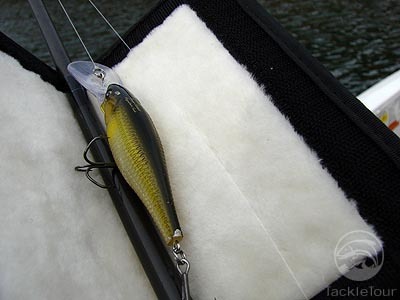 The Sheep�s wool inside keeps the hook from getting caught and holds moisture for keeping pork baits supple. In testing Mark found that he could put a little scent on the Sheep�s wool and next time he used the bait it would be ready to go with the messy job of adding attractant again. The hooks never hang up at all, as natural wool has no closed fibers! The thick strip of Velcro holds the Cover and whatever is inside firmly to your fishing rod no matter how fast the boat was traveling or how rough the conditions. 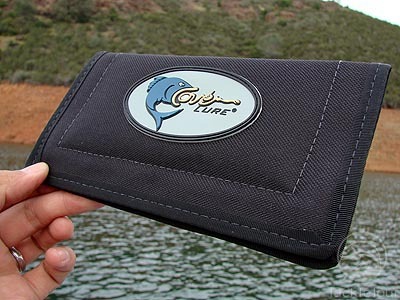 They store easily and don�t take up much space plus and sport an attractive Cover Lure logo.